Senior Companion Orientation Training will be held April 9, 2019-April 12, 2019 from 9:00am-3:00pm. Sunbeam’s Senior Companions are volunteers who are age 55 and above and who are passionate about serving senior adults through Sunbeam’s Senior Companion program. With the goal of helping seniors stay in their home for as long as possible, Senior Companions provide quality, in-home support and companionship to individuals who cannot afford nursing home care. Senior Companion support may include; light housekeeping, errands, doctor’s appointments and playing games. Volunteers are able to give back to the community while providing companionship for another senior adult who may be homebound due to illness or age. Senior Companions receive in-depth, monthly trainings that focus on practical subjects, such as home safety, dental services and caregiver tips. Trainings also consist of health-focused subjects including diabetes, Parkinson’s and Hospice care. How Do I Become a Senior Companion? The Senior Companion Program is open to volunteers 55+ who can serve between 15 and 40 hours per week. Sunbeam provides training before the volunteer meets with his or her match, as well as monthly trainings. The program offers a tax-free, hourly stipend and mileage reimbursement to help cover costs to income-eligible individuals. Volunteers must pass a health screening and background checks. To become a Senior Companion volunteer, or to learn more about how to request a Senior Companion for your loved one, contact Marien Breckenridge at her direct line of 405-609-8930. You may also print and complete the form below and mail to: Sunbeam Family Services, Attn: Senior Companion Program, 1100 NW 14th Street, Oklahoma City, OK 73106. Download the Senior Companion Application Form. Applications are due Feb 28, 2019. How Do I Apply to Have a Senior Companion Stay with My Loved One? Applications to receive a Senior Companion are readily available. For more information contact contact Marien Breckenridge at her direct line of 405-609-8930. When Dorothy Smith turned 65 and retired, she felt that she had too much time on her hands. That’s when she spotted an article about Sunbeam Family Services need for Senior Companion volunteers and knew she would be a good fit. “This program has been so good to help me stay mentally sharp,” said Dorothy. For over 20 years as a Senior Companion, Dorothy has provided supportive friendship to homebound seniors, helped them around the house with light housekeeping, taken them to doctor appointments or provided respite to a caregiver spouse. Volunteering up to three times a week, she’s one of about 100 volunteers who help seniors stay in their homes for as long as possible. Sunbeam’s Senior Companion program is part of the national Senior Corps program established in 1971 for seniors 55+. Sunbeam’s Senior Companion program helps clients remain independent in their home, with a greater quality of life, while providing the volunteer with an opportunity to remain active and give back to their community. Dorothy has been Henri Wilson’s Senior Companion for nearly 20 years. 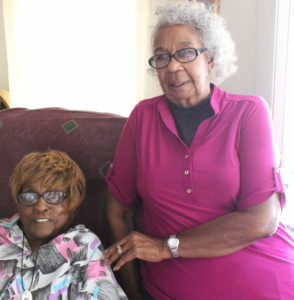 The two women, both long-time community advocates, met years ago during their careers. Today, Henri, who is 78 years old, has mobility problems due to bad knees and has to rely on others to get out of her home. Dorothy takes Henri to community meetings and out to dinner, but she shares that the program helps her just as much as it helps Henri, especially since she lost her husband a few years ago. pre-service training and 4 hours of on-going training each month. were served 2015-2016 fiscal year by Senior Companions. received services through the Senior Companion Program during 2015-2016 fiscal year.